No reason to get confused about the band-name or album-cover. Neither one is pointing you in direction of the music. 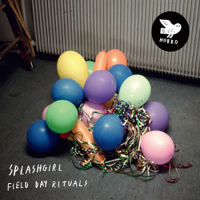 The name Splashgirl and the picture of some abandoned party-baloons don’t indicate that we are in some kind of Esbjörn Svensson trio-like universe. To be precise: it’s the experimental and somber side of Esbjörn Svensson my thoughts brushed upon when I heard this Norwegian trio. In 2011 they released an album which was highly praised in the English music magazines Uncut and Jazzwise. The recent album is recorded in Seattle, where producer Randall Dunn (known from noise-band Sun O))) and the one to produce the next album from Danish Sort Sol) has been behind the magic buttons. What’s interesting is that Dunn has moved the trio in the direction of a more classic sounding jazz – without ending in Bill Evans’ living room. This trio is loaded with bass and black as the night. It’s not the time to kid around. Andreas Stensland Løwe (piano, keys. ), Jo Berger Myhre (bass) and Andreas Lønmo Knudsrød (drums, perc.) have created a special platform for their music. When they let Eyvind Kang play his viola on three numbers then they leave the jazz-trio-galaxy for real. Exciting!